This is the Infrared Knee Support Sleeve that Mike and I have been testing. 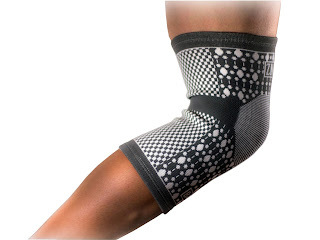 It's self-warming and helps relieve pain and tension in the joint / ligaments of the knee. I found the sleeve fit quite well. It was snug and after a while it did provide some warmth to the entire knee area. It does not get hot, sticky, or itchy. I like to wear the sleeves when I'm going up and down the stairs and exercising. Keeps the knees well-supported. I think two hours is a good time-frame for wearing them. After that your skin needs to breathe. 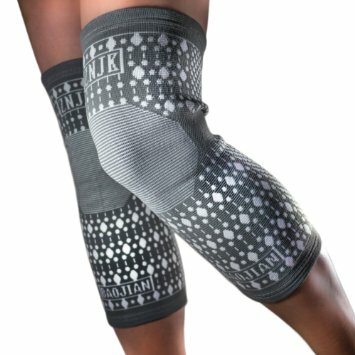 Whether your purchasing to simply warm your knees during the day, use as a recovery aid from sports related injuries, suppress chronic pain, such as arthritis or osteoarthritis, or to provide that needed compression during sports activities, this sleeve was designed to maximize its use. What makes this sleeve unique? 1. Free Range of Motion, Stays Firmly In Place: Designed for maximum comfort, there are no hard edges, instead, the elasticized fabric is ergonomically designed to provide the needed compression and support while keeping the maximum possible comfort. 2. This product is made with activated Black Tourmaline, a naturally occurring semi-precious crystal, containing Boron and complex silicate minerals - known as the "Electric Stone" - as it has been shown to produce a weak electrical charge, which is what enables it to produce and emit Far Infrared Rays (FIR) and Negative Ions. Before the Tourmaline is infused into the fiber it is crushed into powder and altered at the nano-scale to better react with lower temperatures (your own body temperature) to safely emit the Far Infrared Rays. a. The Tourmaline gives the product an antibacterial activity. b. The FIR, while invisible to the naked eye, elevates the knee temperature without making you feel hot. c. The FIR promotes the repair of tissues and the regeneration of cells, aiding in the reduction of inflammation and pain. d. The Product gives you the comfort and support you need, while providing a bonus therapeutic property to the knee. Mike likes to use the sleeves after he gets home from work. He puts a lot of stress on his knees and this definitely helps. He does a lot of squatting and climbing all day -- the support he gets from the sleeves is a blessing. I received a set of Infrared Knee Support Sleeves for the purpose of this review. I received no monetary compensation. All opinions expressed herein are my own and based on my own use of and experience with the item.